John Flannery, the man hired to fix General Electric, inherited a $31 billion ticking time bomb when he replaced longtime CEO Jeff Immelt last year. Like other companies, GE (GE) has accumulated a significantly underfunded pension. 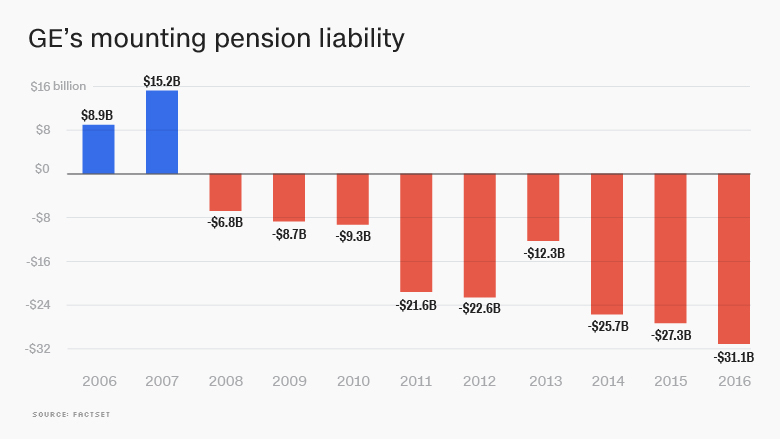 But like most things lately at GE, its pension shortfall is much worse. GE's pension nightmare is the result of years of inattention, and of historically low interest rates that have driven up pension liabilities around the world. This is not just a math problem: More than 600,000 current and former GE employees are relying on these crucial retirement benefits. The pension shortfall is yet more evidence of GE's financial troubles, which forced the iconic company to slash its dividend last year for just the second time since the Great Depression. GE shares closed below $17 on Thursday for the first time in six years. "GE's balance sheet is a mess," said Gautam Khanna, an analyst for Cowen & Co. "They don't generate a lot of cash, and they have a severely underfunded pension plan." GE doesn't owe the $31 billion immediately. Instead, the company is required to make pension payments over time. Under Flannery, GE announced plans in November to tackle the pension problem by taking advantage of cheap borrowing costs. GE said it will borrow $6 billion in 2018 to cover mandatory pension payments through 2020. But that doesn't fix the problem: It's just swapping one IOU for another. "It just buys you time," said Deutsche Bank analyst John Inch. 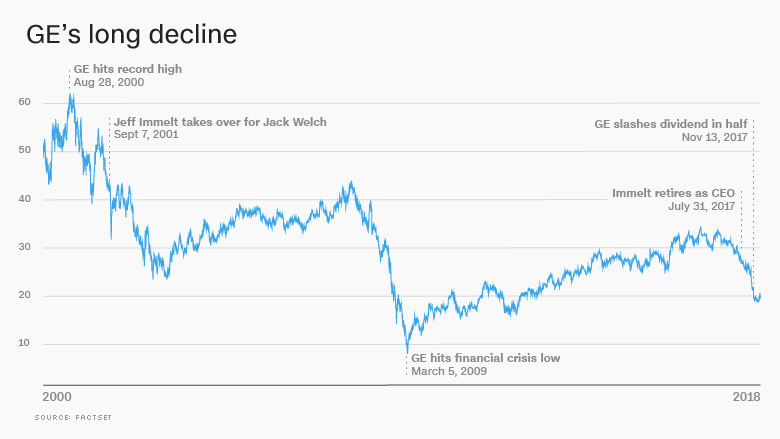 GE's pension shortfall is even more glaring when you consider that the company was sitting on a pension surplus of $14.6 billion in 2001, when Immelt replaced Jack Welch as CEO. Then GE decided to put money into mergers and acquisitions instead of socking it away for what it owed its employees, Inch said. 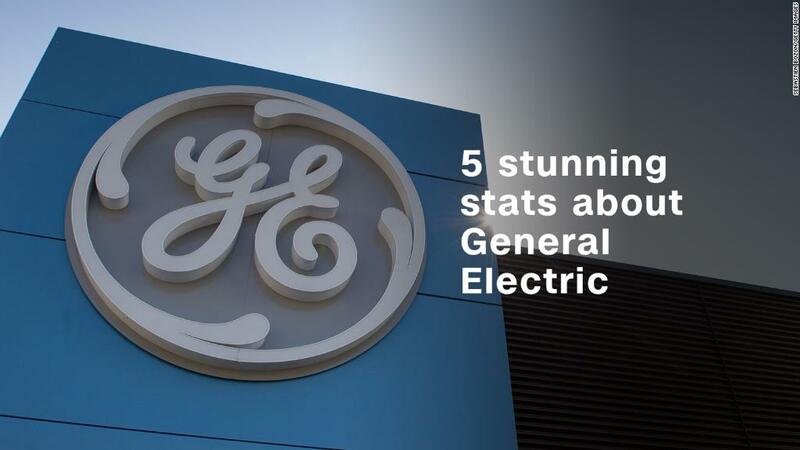 Many of those deals were poorly timed, contributing greatly to GE's current cash crunch. By the end of 2008, GE's pension was running a deficit of $7 billion, and it exploded from there. Despite that shortfall, Immelt rewarded shareholders with stock buybacks, which are aimed at boosting the share price. Between 2010 and 2016, GE spent about $40 billion to buy back its own stock, according to FactSet. "The company was debatably mismanaged," Inch said. "It didn't fund the pension properly, and now you've got a massively unfunded pension." Immelt declined to comment, directing questions to GE. The company declined to comment. To be sure, other major companies have large pension shortfalls. Boeing (BA) listed a $20 billion pension deficit at the end of 2016, and General Motors (GM) faces an $18 billion liability. Corporate pension funds typically invest 40% or more of their assets in bonds like low-yielding government debt, according to the OECD. And a decade of near-zero interest rates has forced companies to assume lower returns. In an SEC filing last year, GE said the increase in its pension deficit is "primarily attributable to lower discount rates" as well as higher liabilities. GE warned that one financial risk it faces is "sustained increases in pension" costs caused by market turbulence or a "continued environment of low interest rates." Yet GE also said that its pension liabilities could go down significantly if rates rise. GE has a huge family of current and former workers to support. The company's various pension plans support about 619,000 people: about 298,000 retirees and beneficiaries, 227,000 vested former employees and 94,000 active workers. GE also sponsors post-retirement health and life insurance benefit plans that cover about 187,000 people. The company tried to ease its pension liabilities by closing the pension plan in 2011 to new salaried workers. But the problem still hangs over GE as it considers a radical shift in the coming months. Flannery confirmed on Tuesday that GE is contemplating what was once unthinkable: breaking the conglomerate up into smaller pieces. But analysts warned that GE's pension liabilities are so large that it could make dismantling the company very messy, if not impossible. "It only makes sense if you ignore GE's pretty massive liabilities -- like the underfunded pensions," said Cowen's Khanna.